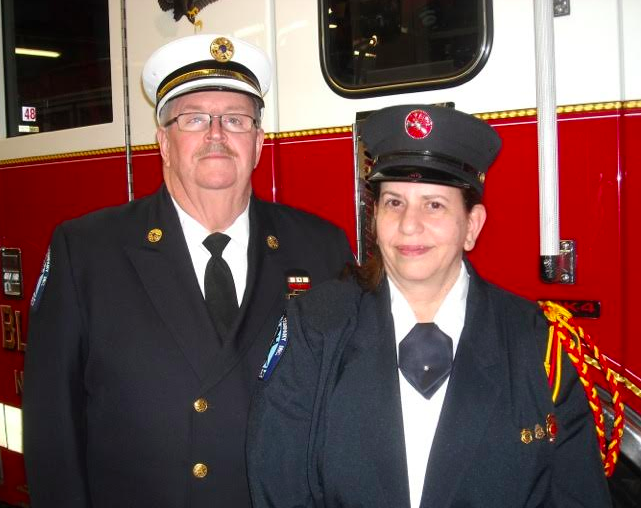 Both Mike and Diane Conklin have volunteered for many years at the Blauvelt Fire Department. The biggest benefits they received are the satisfaction of incorporating service into their lives and making a difference in the community. Mike and Diane Conklin have contributed to the Volunteer Blauvelt Fire Department in many ways. Mike served as Chief of the Department and Incident Commander and is currently the Treasurer. Diane is a member of the Ladies Auxiliary and an instructor in the Explorer Program. In a single-tag system, firefighters keep their assigned nametags fixed to their helmets until they’re assigned an operational function at which time they give their tags to the Incident Commander. The commander keeps the tags organized by the functional positions established. For example, all the nametags for personnel assigned to the roof ventilation group would be clipped together on a command board. This system is used to track firefighters’ movements at an emergency scene. Fire science indicates that smoke takes on four attributes when it exits a building: color, density, velocity and volume. 1 Volume: The main message that the volume of smoke transmits is the type of material being burned as well as the characteristics of the space. A hot fire burning on dry, flammable material near a well-ventilated area may not emit much smoke, but that same fire burning in a poorly ventilated area can quickly begin to surge. 2 Density: With denser smoke, it’s much harder to see into the structure to discover what’s occurring. The smoke density is a measure of how severe the fire is. The denser the smoke coming from the fire, the more fuel there is intermixed with the clouds of smoke, making the smoke more flammable. 3 Color: The color of smoke is the firefighter’s best indication of the fire’s location and the materials being burned. A light or white smoke is often a sign of the start of a fire. Color alone can tell a firefighter a lot about how long the fire has been raging, what type of fire it is, what material is being burned and how dangerous it is. Brown smoke indicates wood is being burned, which often means the fire has consumed the contents of the room and moved into the structure as well. Black smoke can indicate that the fire is spreading quickly and that the smoke suggests a very dangerous fire. 4 Velocity: When the fire begins to spread quickly, it can create a ‘flashover.’ Because velocity is controlled by heat absorption and volume of space, the smoke has to fill before it begins to run out of room. Highly pressurized smoke will show its velocity by finding other escape holes, such as under doors. Both Mike (‘big happy cook’) and Diane (‘busy one who saves lives’) have been presented with the Vigil Honor by the Order of the Arrow. Its mission is to fulfill its purpose as an integral part of the Boy Scouts of America through positive youth leadership under the guidance of selected, capable adults. As scouting’s National Honor Society, the Order of the Arrow promotes camping, responsible outdoor adventure and environmental stewardship as essential components of every scout’s experience, year round and in summer camp. The Vigil Honor is a high mark of distinction and recognition reserved for those adults, who by reason of exceptional service, have made distinguished contributions to the Order of the Arrow.